It's been a worrying couple of years since the release of the last Motörhead album, 2013's excellent Aftershock. Lemmy's health problems are well documented, and it seems every day sees more stories of cancelled concerts. A recent interview in which the 69 year-old reveals that he has switched from whiskey to vodka really sums the man up – he is one of the few remaining icons of rock n'roll excess, and even the news that he walks with a stick because his legs are, to use his word, “fucked” can't quite dispel the aura that surrounds him and Motörhead. Twenty-second album Bad Magic is, as you're already probably aware, awesome. It's a solid distillation of the band's bluesy swagger and proto-metal, nothing new to fans but considering that the band hit forty – and Lemmy hits seventy – this year, would we expect or want it? 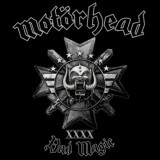 Even knowing the band fairly well by now, I was surprised at how how primal and heavy Bad Magic is, Lemmy's voice familiar yet more of a weathered growl than ever. Opener Victory or Die is typical of late period Motörhead, upbeat, driven by riffs but Lemmy providing the hooks – it's on the following Thunder & Lightning (how have the band never used that title before?!) where the album gets truly terrific, kicking up the speed and heaviness and providing one of a few intriguing hints into Lemmy's mindset with the lyrics - “standing on stage, the thrill never fades”. Sure, musically it's basically Iron Fist, but Lemmy and co are so good at writing and delivering the Motörhead sound that you don't care, and somehow Phil Campbell's guitar leads always sound terrific. What other band could produce songs so effortlessly rocking as Fire Storm Hotel or Shoot Out All of Your Lights, the latter opening with some truly awesome battering from Mikkey Dee? And even at this age, Motörhead manage to surprise; Brian May pops up on the deep and almost doomy The Devil for a guest solo, widdly and nicely flamboyant, while the nihilism always notable in Lemmy's writing seems to come to the fore on tracks like first single Electricity. Lemmy does that rare but terrifying Orgasmatron-esque growl on the otherwise straightforward Evil Eye, but it's the slow and sad ballad Till The End that's the real masterpiece here. For the first time on the album, Lemmy sounds his age, almost Ozzy-like at moments in plaintive despair, and if the band placed it at the end of the tracklisting there would have been real cause for concern. That instead it's followed by Tell Me Who To Kill is reassuring, the band resuming rocking, and from there it's a pretty solid run of murderous tracks through Choking On Your Screams and When The Sky Comes Looking For You. The choice of a Rolling Stones cover to finish the album is an odd one, and indeed as classic a song and fitting thematically as Sympathy For The Devil is, I can't imagine it being top of anyone's favourite Motörhead moments list. Everyone will have their own personal ranking, however, and while I think Aftershock and The World Is Yours were better, Bad Magic is solid and more than good enough to satisfy that itch. Long live rock n' roll.